This is a sponsored post in collaboration with Constant Contact. All opinions are of my own. I started blogging almost eight years ago, and it was one of the best decisions that I've made in my life. I met so many amazing people, and I've also connected with so many amazing brands. One of the things I wish I would have done from day one with my blog is starting an email list. It's such a great way to stay connected with your readers. Whether it's sending out post reminder or updates, and or a Happy Birthday email to readers. Your email list is what's really going to set you apart from everyone else. Not all of your readers are going to check your blog on a daily basis. Having an email list allows you to get in front of your readers on a daily basis. I love sending out weekly newsletters to my readers recapping on the past week and giving a sneak peek to the content that my readers can look forward to seeing in the coming weeks. It also gives me the opportunity to share photo and video with my readers as well as articles that I'm reading myself and loving. Having an email list has allowed me to grow my social media platforms. My welcome email shares all of the social media platforms in which I'm on. I'm able to share with my readers links to the various platforms in which I'm on with my weekly newsletters as well. This allows me to virtually stay connected with my readers not just through my blog. But on a daily basis with my social media platforms. Not all of my readers are on all of the social media platforms. However, this gives them the opportunity to connect with me on their favorite platform and get to know me on a more personal level as well as a little behind the scenes of blog life. 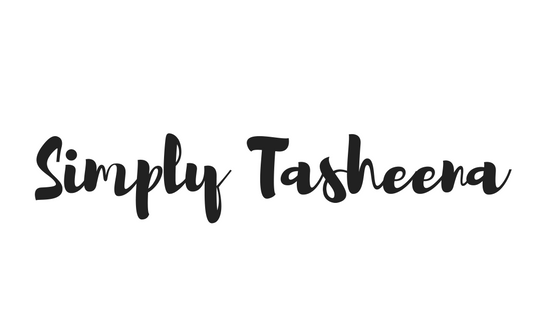 This also allows potential readers who stumble upon my social media channels and may not know that I have a blog to join my email list and stay connected with me on my blog as well. By being able to connect with my readers with my email list. I'm able to connect with my readers on a more personal level. I've learned throughout the years that not everyone feels comfortable commenting on blogs. A lot of times my readers will reply to my email and/or newsletter with questions in which they may have in addition to topics in which they would like me to discuss on my blog and/or social media platforms. One of the things that I feel sets me apart from other bloggers is that I like to add a personal touch with my emails. Whether it's a readers birthday or a simple feature on my social media. Having an email list has allowed me to connect with my readers past my blog, and add a personal touch to the content in which I send out to my email list. 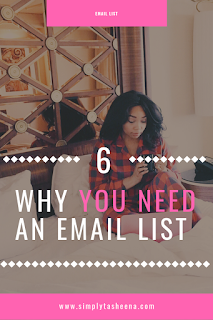 Having an email list is your hub for everything. I've learned that so many bloggers, influencers and business owners are solely relying on their platforms to stay connected with their readers. Honestly, you should have multiple ways to stay connected with your readers just in case. Have you noticed when YouTube, Facebook, and Twitter went down a lot of influencers and business owners were scrambling to contact their readers? Nothing and no one is perfect, in the event that any social media platform and/or if your site is down. You are able to still contact your readers and update them. Almost two years ago, I changed the name of my blog and my email list was the first to know about it and learn about the changes in which I was about to make to my blog. Your email list is your plan "A" it's always there when you need it, and you can access it from anywhere. Having an email list is the fastest way to sell a product or service. Have you noticed the strategic marketing from brands? Ever noticed how and why you receive promotional emails on certain days or time of year. Having an email list is one of the best marketing tools to get your product/service in front of your audience. 2019 is the year to start your blog or business. Stop allowing fear and every excuse in the book to stop you, and starting with an email list is the best way to get started while you're figuring out all of the logistics. The best part about it is all you need is the vision. You can collect emails with your email list until you officially launch your site. Growing a blog is hard, having an email list takes the stress away from working on your blog traffic. Sending out regular emails to my email list has allowed me to triple my blog traffic. He's a great reminder for my readers to visit my blog, and learn about new posts, and it allows me to increase my blog traffic. My email list is something that my readers look forward to receiving, a lot of times they do not have the time to check my blog daily. Buy having an email list I take the stress away and my blog posts are always just a few clicks away in my emails. No matter if start off by having one person on your email list to 100K. The most important factor is actually getting started. Once people learn that you have an email list. Your list will grow. 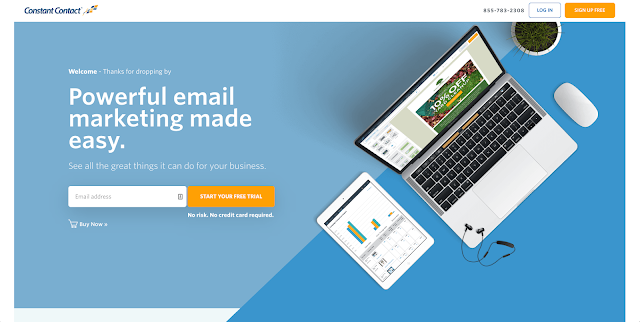 Ready to get started with your email list? When it comes to having an email list. The site I recommend to get started with is Constant Contact. What I love about Constant Contact is that they offer a 60-day trial if you're not ready to commit today. 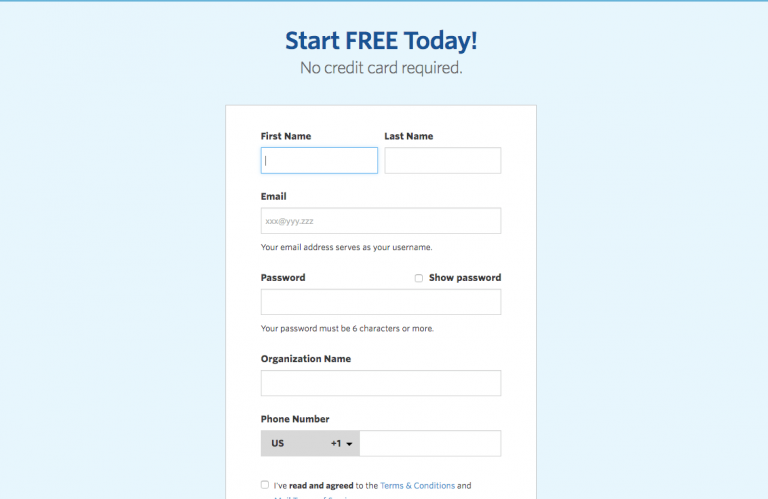 Trust me, you're going to love their service and want to immediately signup. Their platform is user-friendly and perfect if you're just starting out or already have an email list. There are amazing blogs out there. however, having an email list has allowed me to stay connected with potential regular readers. Most people visit a site and never visit again. If you have an email list, it's a great way to turn a quick google search to your site into regular readers by collecting their email address. Everything you said is true about having an email list. People like to use email lists think maybe it is quicker for them. I love the idea of having an email list. I never tried this before but now I am going to, thanks. I don't have one. I personally never join others since I don't have time to read them. Maybe one day I'll start one, but I'll probably forget about it, honestly. I have an email list, but I rarely do anything with it. I need to check up on it more, but my energy is limited along with my time. An email list is definitely beneficial. Truthfully, I have been slacking on mine, but this post reminds me why I need to make it a priority. I don't really have an email list, but I know I should build one and utilize it. Starting an email list/newsletter has been my goal for the past year. I’m dying to do it but it seems so daunting! An email list is the only item that cannot be taken from you. Facebook, Pinterest and Instagram can change their policies and algorithms without asking you. The list is yours forever! I actually just set mine up a few weeks ago and it's been amazing. I wish I would have done it sooner. 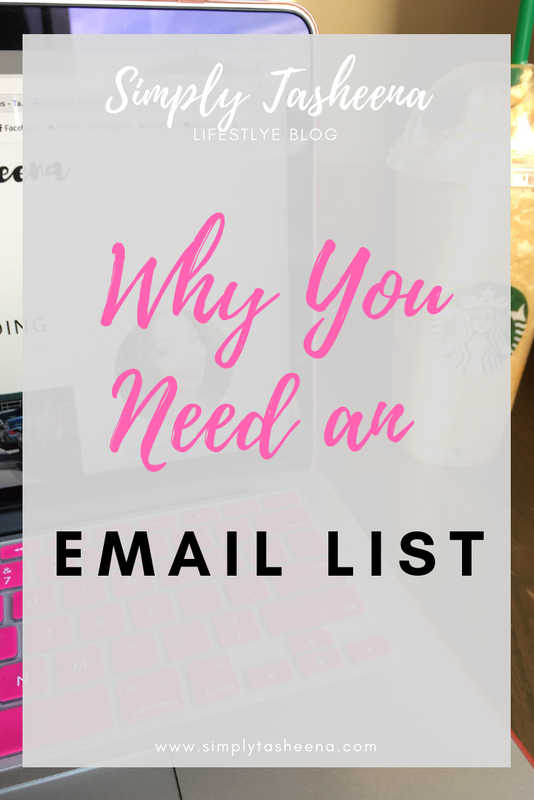 Having an email list is a must for bloggers in my opinion. It really lets you get personal with your dedicated readers. I really need to start growing my email list. This post is such an inspiration! I love my email list. It helps me to communicate with my readers and subscribers. Especially when I need to get a message out quick. 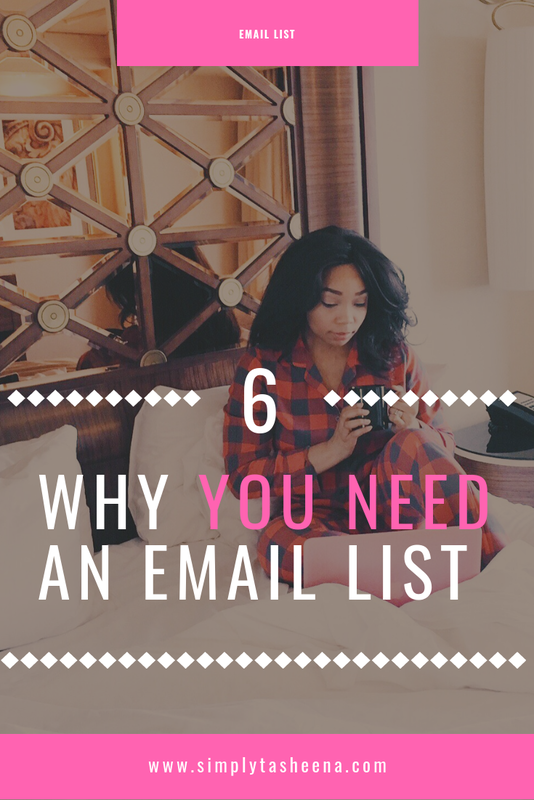 These are really good reasons to start an emailing list when you are blogging! Thanks for the recommendation site! It's so hard to try a good one! I've been meaning to revamp my email marketing strategy. Thanks for the reminder to get to it ASAP! Loved your post! I'm working on growing mine!